Communication networks are very important for a market town like Sudbury, as a good system of public transport and road networks allows access to the settlement for commerce and industry. 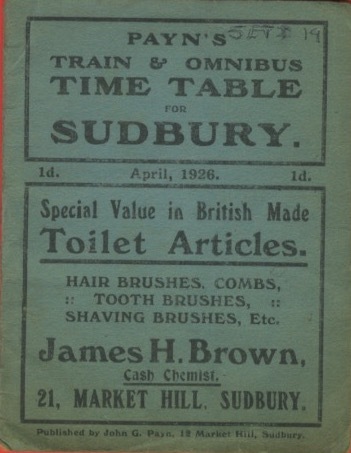 It is many decades since Sudbury suffered the loss of the through rail system to Haverhill and Cambridge and ability to take a connecting train to the King’s Cross mainline. Of course the remaining rail service still permitted access to Colchester and Marks Tey stations and the mainline to Liverpool Street Station. 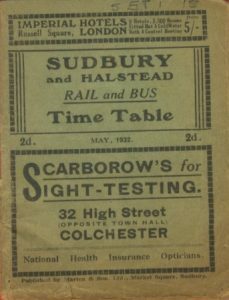 In the 1960’s and 70’s when not every household owned a car or had a qualified driver, this was very important to the newcomers to Sudbury and Great Cornard who had been encouraged to leave London and start a new life in the country. 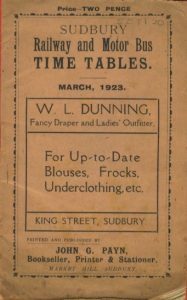 Sudbury Ephemera Archive holds an interesting collection of timetables from the 1920’s that give schedules and routes for the railway and motorbus. 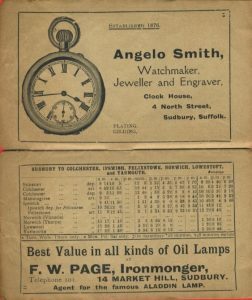 In 1926 the timetable is drawn up using the 12-hour clock and not the 24 hour clock we expect today. The first train in the morning left for Cambridge from Sudbury station at 6.45 AM and arrived in Cambridge 8.05 AM. If the traveller wished to go to London they could catch a train at Saffron Walden and arrive in the city for 9.27 AM. The last train in the Cambridge direction left at 6.43 PM but to reach London it meant leaving Sudbury on the 4.22 PM train. This route also took local people between Sudbury and Long Melford at various times during the day and four of these trains terminated at Long Melford Station. Wednesday (traditionally early closing day in Sudbury and market day in Cambridge) had a variation in the schedule. Other routes included the train from Sudbury to London Liverpool Street changing at Marks Tey. 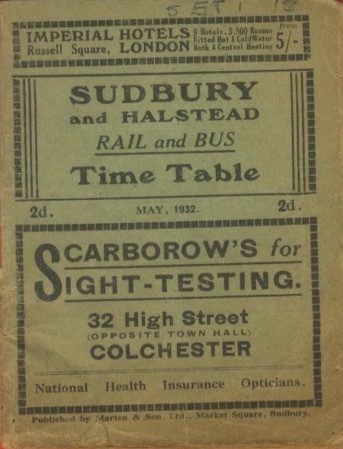 The Sudbury to Colchester train was listed as going on to Manningtree, Ipswich (where the traveller changed for Felixstowe or remained on the train for Norwich), Lowestoft and Great Yarmouth. In Norwich the train stopped at two stations Victoria Station and Thorpe Station (now known as the main station in the city). A third option was to take the Colne Valley line to Halstead and Haverhill, there were four trains per day getting to and from work in the morning and evening, plus mid-morning and after lunch. The alternative method of travel was to use the motorbus. Eastern Counties took passengers from Sudbury Market Hill via Boxford and Hadleigh to Ipswich where it connected with a bus for Felixstowe or continued on to the coast, it is not exactly clear which. 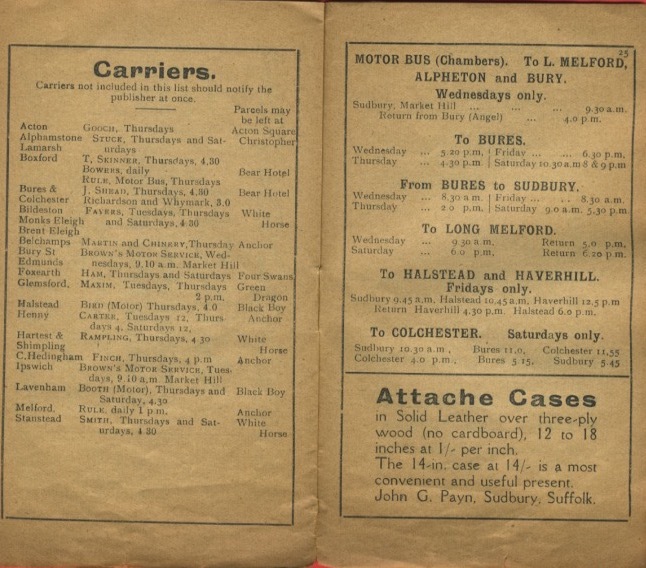 Shead’s bus service operated the service between Sudbury and Bures and the National Company served Sudbury to Clare via long Melford and Glemsford. This service even connected through to Haverhill on Sunday. 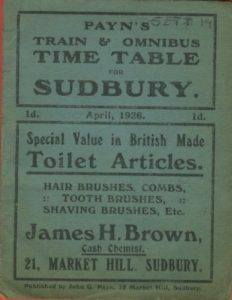 National also operated the Colchester to Sudbury service. Chambers bus service served Sudbury to Bury St Edmunds and Halstead to Haverhill but the service was very limited and it only connected Sudbury with Colchester on a Saturday. The Bird, Brown’s and Booth also operated bus services to local communities, Brown to Ipswich, Bury St Edmunds and Long Melford on certain days of the week. It depended on the route as to whether the bus passed through Hartest or Wepstead. Booth had a Saturday and Thursday service between Great Waldingfield, Lavenham and Sudbury, obviously to the markets. The Bird brought people from Halstead, Twinstead and Pebmarsh at 4.20 PM on Thursday, which was rather late for the market and it does not suggest how they got home again. Watts and Child had a service on Tuesday to Ipswich leaving Halstead at 8 AM, picking up at Sudbury at 8.40 AM and arriving in Ipswich for 10.45 AM. The return journey began at 4.45 PM. On Wednesdays this company did a similar route to Bury St Edmunds (probably for the market) leaving Halstead at 9 AM, arriving in Sudbury 10 AM and Bury St Edmunds at 11.15 AM. The return journey began at 4.30 PM. 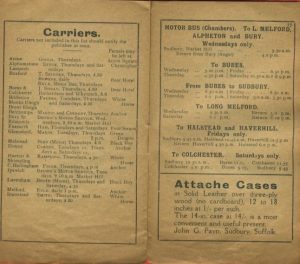 Included within the booklet is a list of all the private carriers who connected villages with Sudbury. Maybe some had a motorbus but as they are stipulated it could be assumed that the other carriers were using horse drawn carts. It was not uncommon for parcels to be taken on public transport for collection at the station or depot, and in the collection we have an example of a parcel being transported. 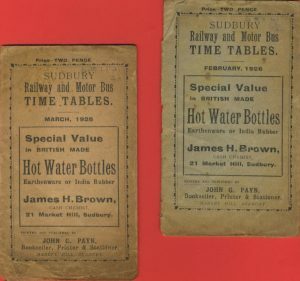 Some bus operators produced their own timetable and it is clear that as the network of bus services opened out it was possible to get further and further away from Sudbury. 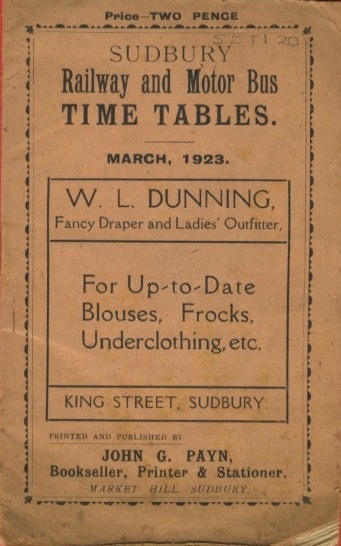 All the timetables are interesting because one presumes that like such publications today the support of advertising space bought by local companies helps to keep the publication cheaper and more affordable. 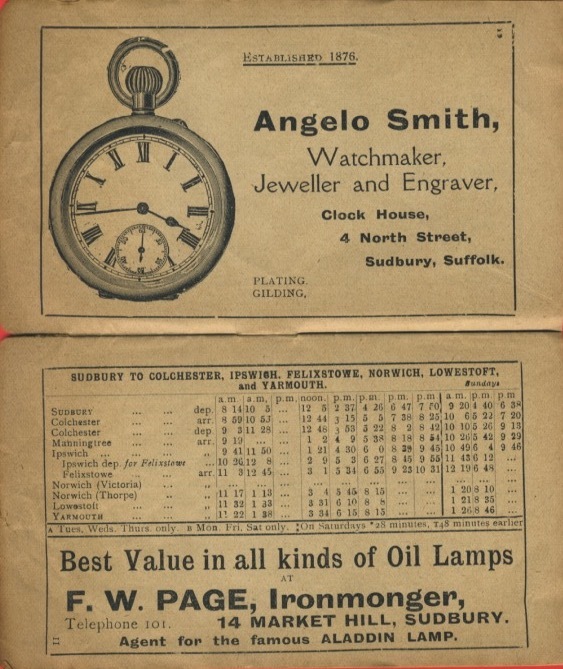 These adverts also give us the idea of the type of shops available in the 1920’s and 30’s. 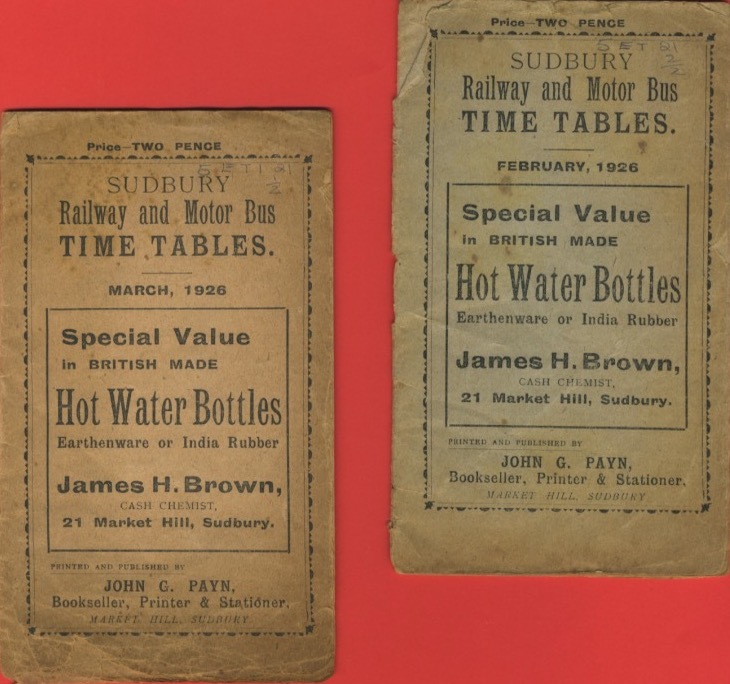 Anybody who is interested in researching public transport in the Sudbury area may contact SEA via this website to look at the collection and study it in more depth.